Topcon QS3 Robotic Systems offer reflectorless measurement superior to any other instrument – capable of precision measurements at a mind-boggling 6,500 ft. (2,000m)! Faster – Smarter – Farther – Stronger. The Topcon QS Series robotic total stations are the latest, most advanced systems on the market today combining modern design and advanced technology. 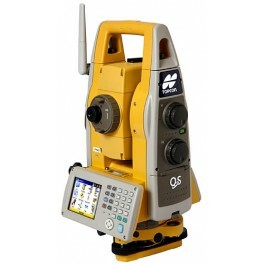 With a modern, cable-free design, the QS Series offers the most advanced robotic technology available. Our one-touch Quick Lock feature that set the standard in robotic target acquisition has taken another step forward with X-TRAC 8, a superior technology solution for strong tracking and quick re-acquisition in challenging environments. Available in 1, 3, and 5 second angle accuracies, you can select the instrument that best fits your requirements. All QS Series Robotic Systems offer reflectorless measurement superior to any other instrument – capable of precision measurements at a mind-boggling 6,500 ft. (2,000m)! Topcon’s new QS Series Robotic Systems: Superior Technology – Superior Design – Superior Performance and Value only from Topcon, the World Leader in Precision Measurement Technology. Prism Mode Fine 0.2mm / 1mm ±(2mm+2ppmxD) m.s.e. Non-Prism Mode Fine 0.2mm / 1mm ±(5mm) m.s.e. Coarse 1mm / 10mm ±(10mm) m.s.e. Non-Prism Long Mode Fine 1mm ±(10mm+10ppmxD) m.s.e.